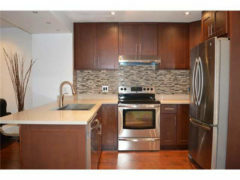 This amazing 3 level TH has been COMPLETELY REMODELLED with $60k in renovations! As you enter, you’ll love the open concept plan. The main floor has new 12mm 6″ wide handsrcaped laminate. A dream kitchen with quartz countertops, stainless steel appliances, deep sink, mosaic backsplash, puck lights. There is an eating area off the kitchen with a sliding patio which leads to landscaped fenced patio. Upstairs has new carpeting & 3 bdrms including an extra large master bdrm. The bathroom is finished with 12×24 tiles, new tub, elongated toilet. Bsmt is finished with rec room, den, stacking washer & dryer & new h/w tank. Pot lights throughout main & bsmt. Windows were recently replaced. Great location! Bus, school, shopping close by.